Lord's Cricket Ground, commonly known simply as Lord's, is a cricket venue in St John's Wood, London. Named after its founder, Thomas Lord, it is owned by Marylebone Cricket Club (MCC) and is the home of Middlesex County Cricket Club, the England and Wales Cricket Board (ECB), the European Cricket Council (ECC) and, until August 2005, the International Cricket Council (ICC). Lord's is widely referred to as the Home of Cricket and is home to the world's oldest sporting museum. 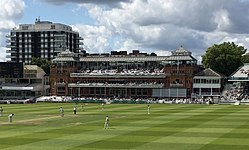 Lord's today is not on its original site, being the third of three grounds that Lord established between 1787 and 1814. His first ground, now referred to as Lord's Old Ground, was where Dorset Square now stands. His second ground, Lord's Middle Ground, was used from 1811 to 1813 before being abandoned to make way for the construction through its outfield of the Regent's Canal. The present Lord's ground is about 250 yards (230 m) north-west of the site of the Middle Ground. The ground can hold 28,000 spectators. Proposals are being developed to increase capacity and amenity. As of December 2013[update], it was proposed to redevelop the ground at a cost of around £200 million over a 14-year period. The current ground celebrated its two hundredth anniversary in 2014. To mark the occasion, on 5 July an MCC XI captained by Sachin Tendulkar played a Rest of the World XI led by Shane Warne in a 50 overs match. Acting on behalf of the White Conduit Club and backed against any losses by George Finch, 9th Earl of Winchilsea and Colonel Charles Lennox, Thomas Lord opened his first ground in May 1787 on the site where Dorset Square now stands. The White Conduit moved there from Islington soon afterwards and reconstituted themselves as Marylebone Cricket Club (MCC). In 1811, feeling obliged to relocate because of a rise in rent, Lord removed his turf and relaid it at his second ground. This was short-lived because it lay on the route decided by Parliament for the Regent's Canal. The "Middle Ground" was on the estate of the Eyre family, who offered Lord another plot nearby; and he again relocated his turf. The new ground, on the present site, was opened in the 1814 season. The earliest known match was MCC v Hertfordshire on 22 June 1814. This is not rated a first-class match. MCC won by an innings and 27 runs. The next match known to have been played at Lord's, from 13 to 15 July 1814, was the earliest first-class one, between MCC and the neighbouring St John's Wood club, which had several guest players for the occasion, including five leading professionals. MCC won by 4 wickets. The annual Eton v Harrow match was first played on the Old Ground in 1805. There is no record of the fixture being played again until 29 July 1818, when it was held at the present Lord's ground for the first time; Harrow won by 13 runs. From 1822, the fixture has been almost an annual event at Lord's. Many of the stands were rebuilt in the late 20th century. In 1987 the new Mound Stand, designed by Michael Hopkins and Partners, was opened, followed by the Grandstand (by Nicholas Grimshaw) in 1996. Most notably, the Media Centre (by Future Systems) was added in 1998-9; it won The Royal Institute of British Architects Stirling Prize for 1999. The ground can currently hold up to 28,000 spectators. The two ends of the pitch are the Pavilion End (south-west), where the main members' pavilion is located, and the Nursery End (north-east), dominated by the Media Centre. The main survivor from the Victorian era is the Pavilion, with its famous Long Room; this was built in 1889–90 to the designs of architect Thomas Verity. This historic landmark— a Grade II*-listed building— underwent an £8 million refurbishment programme in 2004–05. The pavilion is primarily for members of MCC, who may use its amenities, which include seats for viewing the cricket, the Long Room and its Bar, the Bowlers Bar, and a members' shop. At Middlesex matches the Pavilion is open to members of the Middlesex County Club. The Pavilion also contains the dressing rooms where players change, each of which has a small balcony for players to watch the play. In each of the two main dressing rooms are honours boards which commemorate all the centuries scored in Test matches or One Day Internationals (ODI) at Lord's, all instances of a bowler taking five wickets in a Test or ODI innings and all occurrences of a bowler taking ten wickets in a Test match. The only cricketer to hit a ball over the pavilion was Albert Trott, off Monty Noble on 31 July 1899. Another highly visible feature of the ground is Old Father Time, a weather vane in the shape of Father Time, currently adorning a stand on the south-east side of the field. The Media Centre was commissioned in time for the 1999 Cricket World Cup, and was the first all-aluminium, semi-monocoque building in the world. It was built and fitted out in two boatyards, using boat-building technology. The centre stands 15 metres (49 ft) above the ground and its sole support comes from the structure around its two lift shafts— it is about the same height as the Pavilion directly opposite it on the other side of the ground. The lower tier of the centre provides accommodation for over 100 journalists, and the top tier has radio and television commentary boxes. The centre's only opening window is in the broadcasting box used by BBC Test Match Special. The building was awarded the RIBA Stirling Prize for architecture in 1999. The Lord's Taverners, a charitable group comprising cricketers and cricket-lovers, take their name from the old Tavern pub at Lord's, where the organisation's founders used to congregate. The pub no longer exists, and the Tavern Stand now stands on its former site. However, a new pub of the same name is open in the grounds, as well as the Members Bar, in the Pavilion. One of the most distinctive and famous features of the Lord's ground is the significant slope across the field. The north-west side of the playing surface is 2.5 metres (8 ft 2 ins) higher than the south-east side. This slope causes appreciable deviation in bounce of the ball on the pitch, making it easier to move the ball in to right-handed batsmen when bowling from the Pavilion End, and easier to move it away when bowling from the Nursery End. The outfield was notorious for becoming waterlogged, resulting in considerable loss of play due to rainfall, until clay soil was relaid with sand during the winter of 2002–2003. One of the features of the ground is the pair of ornamental gates, named in honour of W. G. Grace. In 1923, the W. G. Grace Memorial Gates were erected at the St John's Wood Road entrance to the ground. They were designed by Sir Herbert Baker and the opening ceremony was performed by Sir Stanley Jackson, who had suggested the inclusion of the words The Great Cricketer in the dedication. Temporary floodlights were installed at the ground in 2007, but were removed in 2008 after complaints of light pollution from local residents. In January 2009, Westminster City Council approved use of new retractable floodlights designed to minimise light spillage into nearby homes. Conditions of the approval included a five-year trial period during which up to 12 matches and 4 practice matches could be played under the lights from April to September. The lights must be dimmed to half-strength at 9.50 pm and be switched off by 11 pm. The floodlights were first used successfully on 27 May 2009 during the Twenty20 Cup match between Middlesex and Kent. Lord's hosts Test matches, one-day internationals, some Middlesex home matches, MCC matches and (starting with a fixture between Middlesex and Surrey in July 2004) some of Middlesex's home Twenty20 games. Lord's typically hosts two Tests every summer plus two one-day internationals. Lord's also plays host to the finals of the National Village Cricket Competition, the MCC Universities Challenge tournament and the Royal London Cup. On 7 September 1963 Lord's hosted the first Gillette Cup final. The Gillette Cup was the first major one-day tournament. The oldest permanent fixture at Lord's is the annual Eton versus Harrow match which began in 1805 (Lord Byron played in the 1805 Harrow XI) and celebrated its bicentenary in 2005. Since 2000 it has been 55 overs per side, but before that it was declaration and before that it was two innings per side over two days. Eton has the balance of wins, but the victor in the bicentenary year was Harrow. Lord's is the home of the MCC Museum, which is the oldest sports museum in the world, and contains the world's most celebrated collection of cricket memorabilia, including The Ashes urn. MCC has been collecting memorabilia since 1864. The items on display include cricket kit used by, inter alia, Victor Trumper, Jack Hobbs, Don Bradman and Shane Warne; many items related to the career of W. G. Grace; and curiosities such as the stuffed sparrow that was 'bowled out' by Jahangir Khan of Cambridge University in delivering a ball to T. N. Pearce batting for MCC on 3 July 1936. It also contains the battered copy of Wisden that helped to sustain E. W. Swanton through his captivity in a Japanese prisoner-of-war camp during World War II. The Museum continues to collect historic artefacts and also commissions new paintings and photography. A recently opened exhibition, which celebrates the life and career of Brian Lara, is especially suitable for children. It contains the Brian Johnston Memorial Theatre, a cinema which screens historical cricket footage for visitors. Lord's also has one of the largest and most comprehensive collection[s] of books and publications dedicated to cricket. The library includes over 17,000 volumes and is open by appointment. In 2010, a selection of 100 duplicates from the library's collection was offered for auction by Christie's with proceeds going to support the library. Over one hundred Test matches have been played at Lord's, the first in 1884 when England defeated Australia by an innings and 5 runs. Australia's first win was in 1888 by 61 runs. South Africa played their first Test match at Lord's in 1907 and the ground was the host to an Australia v South Africa Test match in 1912. The West Indies appeared in a Test match at Lord's for the first time in 1928, to be followed by New Zealand (1931), India (1932), Pakistan (1954), Sri Lanka (1984), Zimbabwe (2000) and Bangladesh (2005). The hundredth Lord's Test match was in 2000, England v West Indies. As of 25 August 2010 England have played 119 Test matches at Lord's, winning 45, losing 28 and drawing 46. Lord's often hosts two Test matches each summer, one match for each visiting team. In 2010, the ground hosted three Test matches: as well as England's matches against Bangladesh and Pakistan, a Test match between Australia and Pakistan was held there in July. Lord's was the venue of the 2000th test match when England hosted India from 21 to 25 July 2011. Lord's was the venue for the Archery at the 2012 Summer Olympics. A baseball game was held at Lord's during World War I to raise funds for the Canadian Widows and Orphans Fund. A Canadian team played an American team in a match watched by 10,000 people. Bowls, archery and several other sports have been played at Lord's in the past, but never rugby or football. Lord's was also one of the venues for the 2012 Summer Olympics. The archery competition took place in front of the Pavilion, with the archers positioned in front of the Pavilion and the targets placed in front of the Media Centre just past the wicket table. [clarification needed] Lord's also houses a real tennis court. Most Test runs (2015) and centuries (6) at Lord's. In 1990 against India, Gooch scored a record 333 & 123. Best innings analysis (8/38) and joint most Test wickets (26) by an overseas bowler at Lord's. His 254 in 1930, a ground record for 60 years, set up a total of 729/6 declared, which remains the ground record. Most Test wickets (103) at Lord's. All records correct as of 17 January 2019[update]. ^ "Lord's". Cricinfo. Retrieved 22 August 2009. ^ Bose, Mihir (1 March 2013). "At home: Derek Brewer". Financial Times. Retrieved 2 March 2013. ^ Bolton, Paul (3 December 2013). "MCC's £21m Warner Stand revamp will increase Lord's capacity by 100". The Daily Telegraph. London. Retrieved 5 January 2014. ^ "Sachin Tendulkar and Rahul Dravid re-unite; to face off against Shane Warne again". Yahoo! Cricket. 6 February 2014. Archived from the original on 2 March 2014. ^ a b Warner, p. 18. ^ "MCC v Hertfordshire, June 1814". CricketArchive. Retrieved 15 October 2016. ^ "MCC v St John's Wood, July 1814". CricketArchive. Retrieved 15 October 2016. ^ a b "Lord's Ground" (PDF). Retrieved 6 January 2015. ^ "Lord's milestones". Retrieved 6 January 2015. ^ "LORD'S MEDIA CENTRE (1999)". Archived from the original on 6 January 2015. Retrieved 6 January 2015. ^ Williamson, Martin (19 June 2010). "Albert Trott's mighty hit". ESPNcricinfo. ^ Alexander, Gus. "The Lord's test | Magazine Features". Building. Retrieved 29 May 2015. ^ Reed, Ellie (29 January 2014). "Father Time and the Lord's Slope". Lord's: The Home of Cricket. ^ Lord's milestones – 1923 Archived 2 October 2008 at the Wayback Machine. Retrieved on 9 November 2008. ^ Keeping Lord's world-class at official website. ^ "Lord's floodlights just 'isn't cricket'". Get West London. 1 October 2013. ^ "Lord's hosts first Gillette Cup final". ESPN Cricinfo. Retrieved 7 September 2016. ^ a b "MCC Library". Lord's: The Home of Cricket. Retrieved 15 August 2014. ^ "Release: christie's to offer a selection of items from the mcc collections". 21 October 2010. Retrieved 15 August 2014. ^ "Records / 2010 / Test matches / Match results". Retrieved 6 January 2015. ^ "India tour of England, 2011 / Scorecard". Retrieved 6 January 2015. ^ "Cricket on hold as Lord's hosts archery". Wisden India. 26 July 2012. ^ "Statistics / Statsguru / Test matches / Batting records / Lord's / Runs scored". ESPN Cricinfo. Retrieved 17 January 2019. ^ "Statistics / Statsguru / Test matches / Batting records / Lord's / Runs scored in an innings". ESPN Cricinfo. Archived from the original on 11 August 2011. Retrieved 17 January 2019. ^ "Statistics / Statsguru / Test matches / Batting records / Lord's / Hundreds scored". ESPN Cricinfo. Retrieved 17 January 2019. ^ "Statistics / Statsguru / Test matches / Bowling records / Lord's / Wickets taken". ESPN Cricinfo. Retrieved 17 January 2019. ^ "Statistics / Statsguru / Test matches / Bowling records / Lord's / Wickets taken (Non-England)". ESPN Cricinfo. Retrieved 17 January 2019. ^ "Statistics / Statsguru / Test matches / Bowling records / Lord's / Wickets taken in an innings". ESPN Cricinfo. Archived from the original on 11 August 2011. Retrieved 31 August 2011. ^ "Statistics / Statsguru / Test matches / Bowling records / Lord's / Wickets taken in a match". ESPN Cricinfo. Archived from the original on 11 August 2011. Retrieved 31 August 2011. ^ "Statistics / Statsguru / Test matches / Team records / Lord's / Team score". ESPN Cricinfo. Retrieved 31 August 2011. ^ "Statistics / Statsguru / Test matches / Team records / Lord's / Team score (lowest)". ESPN Cricinfo. Retrieved 31 August 2011. ^ "Statistics / Statsguru / Test matches / Partnership records / Lord's / Partnership runs". ESPN Cricinfo. Retrieved 31 August 2011. Midwinter, Eric (1981). W. G. Grace: His Life and Times. George Allen and Unwin. Warner, Pelham (1946). Lord's 1787–1945. Harrap. Rice, Jonathan (2001). One Hundred Lord's Tests. Methuen Publishing Ltd.
Wright, Graeme (2005). Wisden at Lord's. John Wisden & Co. Ltd.
Wikimedia Commons has media related to Lord's Cricket Ground. This page was last edited on 22 April 2019, at 10:08 (UTC).